Zhanna Harutyunyan believes in the power of human connection. “I work for and with people,” the 37-year-old Project Expert for the United Nations Development Program in Women and Local Democracy said. How did she arrive at this point? When she was 19, a friend asked Zhanna if she wanted to take English lessons with him at the YMCA. This opened a new world of possibilities for her. By age 22, Zhanna was working with civic education instructors in an international organization who were experts in voters’ rights and other kinds of legislation. Her job was to “somehow help this group of awesome experts, who were twice my age, to teach with residents rather than at them.” It was then that she knew she wanted to become more than a teacher, to be active with non-profits to help get out into the community. 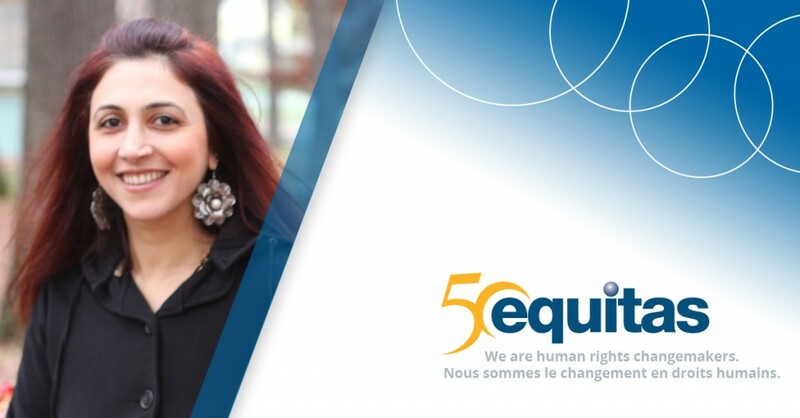 Zhanna was accepted in the 2004 Equitas’ International Human Rights Training Program (IHRTP), in Montreal, Canada. Though only three weeks long, the program was so powerful that it changed the direction of her life. “I saw the potential for John Lennon’s song, ‘Imagine’ to be realized.” “When I saw so many smart, dedicated people from so many different backgrounds working together, I could ‘imagine that the world can live as one’. My level of tolerance increased 100%. Now, when I work with groups, if someone is not doing the work the way you would like them to do it, it is my job to understand them, not criticize them. I am not naturally patient, but I learned from Equitas how important it is to practice patience in order to work with human rights effectively.”Zhanna found work with the Caritas organization, the social action branch of the Catholic Church. Heading a project on domestic violence in her home city of Gyumri, Armenia, she used theatre and discussion to raise awareness. Travelling to over 50 locations with a troupe of actors, she learned that “the effectiveness of the program will be measured by the length and liveliness of the discussion.” She used what she learned at Equitas to help Caritas move its community work and social care from a charity-based approach to a human rights-based approach. Instead of saying, “You are poor, you need food,” we said, “You have a basic human right to good nutrition, hygiene, clean water, and information.” This approach helped the organization to win major funding for elder care in Northern Armenia. During her 6 years at Caritas, Zhanna returned to Equitas several times as both facilitator and co-facilitator at the IHRTP. In 2010, she was recognized for her expertise with a Muskie fellowship to the State University of New York, Binghamton, earning both a Master’s in Public Administration and a certificate in Non-Profit management. Today, Zhanna is a Project Expert for the UNDP in the “Women in Local Democracy” Project. Based in the capital of Yerevan, she creates manuals, films, and outreach programs that help women become more involved in local politics. “Women in Armenia have 60% of the college degrees but hold only 2% of the mayoral positions and 10% of the jobs on community councils.” They often have to have a job and still do all the difficult, manual labour of keeping a family going so they often have a difficult time imagining why they would want to take on an unpaid position on their city Council. One thing is clear — no matter where the next turn of her journey takes her, Zhanna Harutyunyan will be continuing to be working for and with people, helping them imagine a world that can live as one.